The Lemosho Route is the longest of the major routes for climbing Kilimanjaro, and as its an 8 day hike it makes it most expensive also because of the remoteness of the trailhead. You will get to see plenty of game animals on the first of the hike. Due to the amount of days involved you acclimatize better and therefore you stand a better chance of reaching the summit are that much greater. This route is defiantly one of the most scenic routes. The first couple days of Lemosho start well west of the other routes, but on day 4 it merges with Machame and becomes the same from there on out and just as most Machame groups descend on the separate Mweka Route, Lemosho groups typically do as well. Arrival at Kilimanjaro International Airport, meet and great then transfer to your hotel in Moshi, briefing about your hiking trip by our guide. From hear the road is not pleasant jeep is required it will leads to Lemosho Glages (2390m / 7830ft, 11km, 45 minutes) and a possible campsite. Walk along forest trails to Mti Mkubwa (Big tree) Campsite. After breakfast, we continue as the trail gradually steepens and enters the giant heather moorland zone. Several streams are crossed then it gains Shira Ridges at about 3600m / 11,810ft and drops gently down to Shira Plateau. And camp at Shira 1 Camp. Dinner and Overnight at the Camp Site. Continue upto 12,600ft Shira 2 camp on the moorland meadows by stream. A variety of walks are available on the Plateau making this an excellent acclimatization day. After breakfast, we continue upto 12,600ft Shira 2 camp on the moorland meadows by stream. A variety of walks are available on the Plateau making this an excellent acclimatization day. From the shira plateau, we continue to the east, passing junction towards the peak of Kibo. As you continue, direction changes to the South East towards the lava Tower, called the Sharks Tooth Shortly after the tower, you will come to the second junction which brings you up to the Arrow Glacier at an altitude of 4876m / 15,997ft. You shall now continue down to the Barranco Hut at an altitude of 3860m 12,664ft. Here you shall rest, enjoy dinner, overnight. Although you shall end the day at the same elevation as when you started, this day is very important for acclimatization and will help your body prepare for a great day-summit day. After breakfast, you leave the Karanga Valley and pass the junction which connects with the Mweka Trail. You shall continue to the Barafu Hut, which is located at an altitude of 4600meters (15,092ft). You completed the South Circuit, which offers views of the summit from many different angles. Here you shall make camp, rest, enjoy dinner and prepare for the summit day. The two peaks of Mawenzi and Kibo are be seen from this position. Early morning you shall continue on your way to the summit of Uhuru Peak at 5985meters (19,636ft). This part of the climb takes about 4 hours. It can be very cold at night at these elevations, but it will be quite warm by the end of hiking day. You will need to take clothing for both extremes with you. 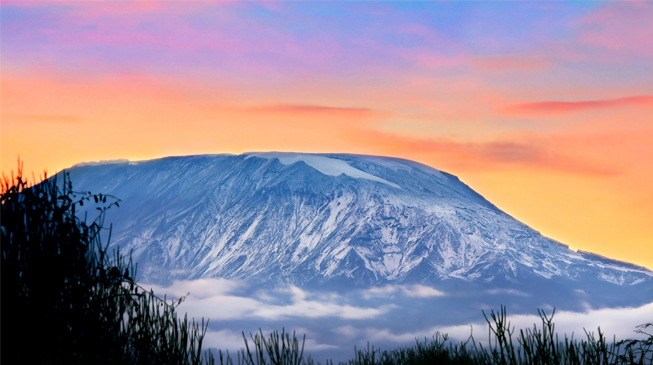 At Uhuru peak, you would have reached the highest point on Mount Kilimanjaro and the continent of Africa. Faster hikers will see the sunrise from the summit. From the summit, you shall now make your descent continuing straight down to the Millennium Camp site at 3300m. Dinner and overnight in Camp. After breakfast, we continue the descent down to the Mweka Park Gate. At lower elevations, it can be wet and muddy. One shall need Gaiters and trekking poles will help. Shorts and t-shirts will nice to wear. (Keep rain great and warmer clothing handy). A vehicle will ready at Mweka Village to drive you back to the Hotel in Moshi. Dinner and overnight. International Flights, Hard and soft drinks and Tips, and all mountain Gears.